As a coeliac who reacts to even the slightest trace of gluten, I feel like I always have food in my bag. A quick lunch at a restaurant or cafe just isn't going to happen, lunches are always packed and wrapped, snacks are always close at hand in case the hunger monster strikes - and a barbecue with friends means bringing along a "safe" dish so the host doesn't have to fret. Because of this, I've come up with a plethora of "portable" recipes that I know I can make for those times I need to eat on the run. Whilst I have plenty of falafel and lentil bite recipes, I didn't have a savoury bite recipe that was paleo - so when Jess sent me an email asking if I had a paleo alternative to falafel that was portable, easy to make and delicious - I knew I had to get to work. 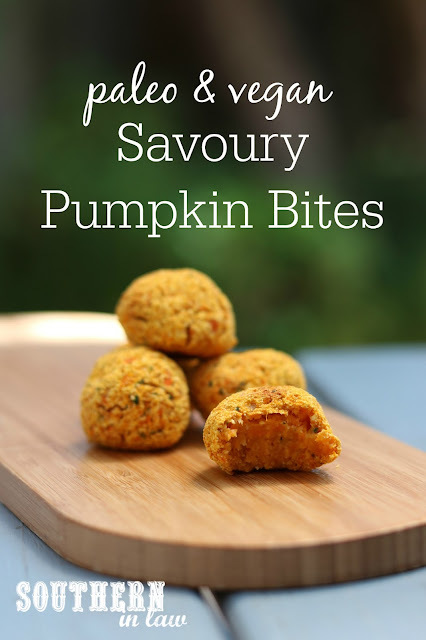 Enter these savoury pumpkin bites - or butternut squash bites, if you're reading this in the US of A. 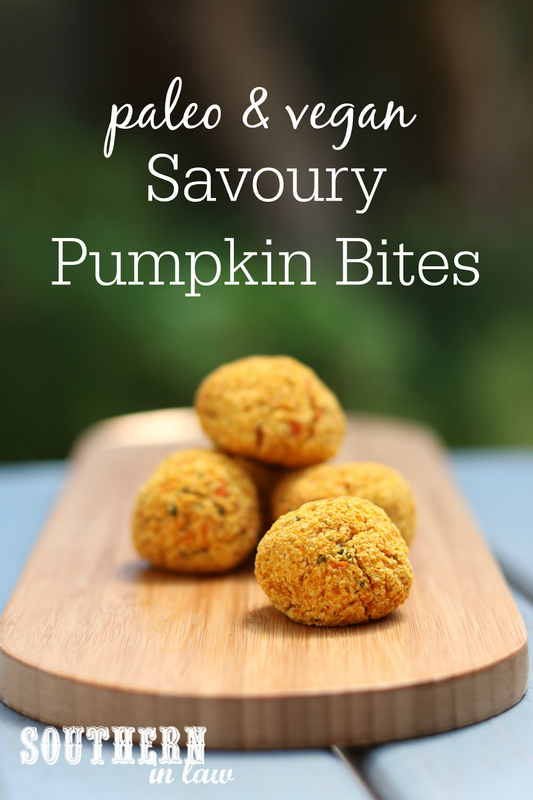 They're super simple to make and seriously delicious - and they make the perfect snack or meal addition. 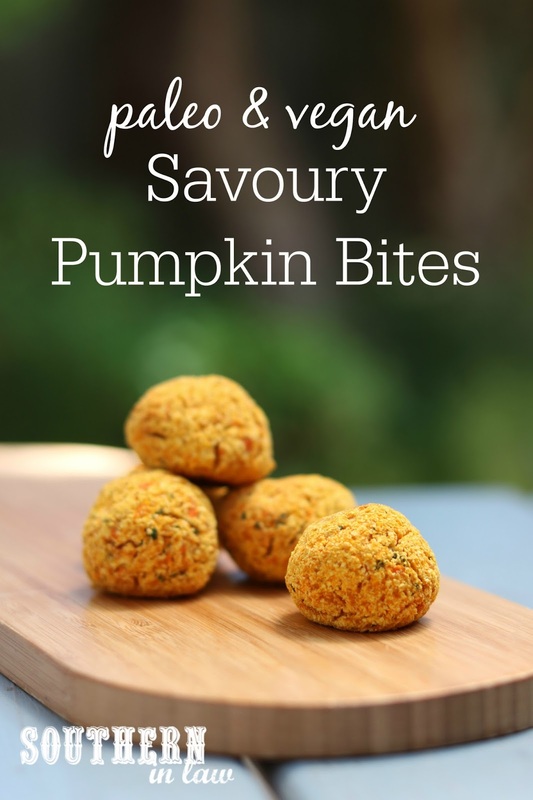 I've been having these for lunches on top of salads or with veggies - and they're perfect for dunking into guacamole or your favourite paleo dip. Steam or boil your pumpkin until soft (you can also roast it in the oven, however, I find the texture is better if you steam your pumpkin). In a food processor, process your carrot and onion until finely chopped. Add your parsley and process until chopped. Add your cooked pumpkin to your food processor and process until everything is mixed together and no large chunks remain. Add in your cumin, garlic salt and coconut flour and pulse until combined, mixing with a spatula to ensure everything is incorporated. If needed, add a little bit more coconut flour to make your mixture just firm enough to roll into balls. Roll your mixture into balls, about a heaped tablespoon in size and place each ball onto your baking sheet. Bake for 25-30 minutes or until lightly golden and the top appears "cracked" as the picture shows. These will firm up as they cool. Note: the bottom will be a darker brown - but don't worry! Leave your bites to cool for 10-15 minutes before removing them from the tray. Eat warm, hot or chilled however you like! We like to use ours as a salad topper or to dip into our favourite dips. What's your go to on-the-go lunch?